Can you believe it? We just finished Christmas glassware marketing, and now Valentine Day is on the horizon! Order your red, pink, purple and clear glassware for Valentine’s Day now and plan an eye-catching window display in your shop with reed diffusers and other contents. 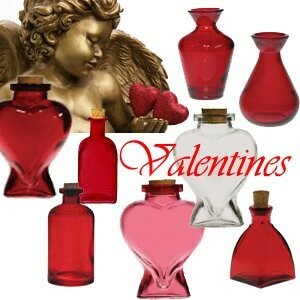 We even have heart-shaped bottles and vases too. All of our glassware is recycled and available in absolutely brilliant colors. There’s now no reason why you can’t be a “green” glassware resource and still have the most attractive glass on Main Street.